For other uses, see dumbwaiter (disambiguation). 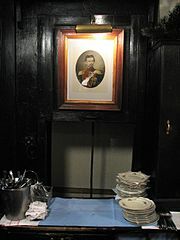 A dumbwaiter also known as a lazy waiter (Speiseaufzug) in the oldest restaurant in Munich, the Hundskugel, with the hand-pulled cart in the "UP" position and only the rope visible. A dumbwaiter is a small freight elevator or lift intended to carry objects rather than people. Dumbwaiters found within modern structures, including both commercial, public and private buildings, are often connected between multiple floors. When installed in restaurants, schools, hospitals, retirement homes or in private homes, the lifts generally terminate in a kitchen. The term seems to have been popularized in the United States in the 1840s, after the model of earlier "dumbwaiters" now known as serving trays and lazy Susans. The mechanical dumbwaiter was invented by George W. Cannon, a New York City inventor. Cannon first filed for the patent of a brake system (US Patent no. 260776) that could be used for a dumbwaiter on January 6, 1883. Cannon later filed for the patent on the mechanical dumbwaiter (US Patent No. 361268) on February 17, 1887. Cannon reportedly generated a vast amount of royalties from the dumbwaiter patents until his death in 1897. A simple dumbwaiter is a movable frame in a shaft, dropped by a rope on a pulley, guided by rails; most dumbwaiters have a shaft, cart, and capacity smaller than those of passenger elevators, usually 45 to 450 kg (100 to 992 lbs.) Before electric motors were added in the 1920s, dumbwaiters were controlled manually by ropes on pulleys. Early 20th-century building codes sometimes required fireproof dumbwaiter walls and self-closing fireproof doors and mention features such as buttons to control movement between floors and locks on doors preventing them from opening unless the cart is stopped at that floor. Dumbwaiter Lifts in London were extremely popular in the houses of the rich and privileged. Maids would use them to deliver laundry to the laundry room from different rooms in the house. This obviated carrying handfuls of dirty washing through the house, saving time and preventing injury. [There is] ... great play between the cart of the dumb-waiter and the guides on which it runs, with the result that the running of the cart is accompanied by a loud noise. The rope which operates the cart of the dumb-waiter runs in a wheel with a very shallow groove, so that the rope is liable to and does at times slip off. ... The cart has no shock absorbers at the top, so that when it strikes the top of the shaft or wheel there is a loud report. ... [T]he ropes of the dumb-waiter strike such wall at frequent intervals with a loud report. ... [T]he dumb-waiter is often negligently operated, by running it faster than necessary, and by letting it go down with a sudden fall. More recent dumbwaiters can be more sophisticated, using electric motors, automatic control systems, and custom freight containers of other kinds of elevators. Recently constructed book lifts in libraries and mail or other freight transports in office towers may be larger than many dumbwaiters in public restaurants and private homes, supporting loads as heavy as 450 kg (992 lbs). Building codes have regulated the construction and operation of dumbwaiters in parts of North America since the 19th century. Modern dumbwaiters in the United States and Canada must comply with American Society of Mechanical Engineers (ASME) codes and, therefore, have features similar to those of passenger elevators. The construction, operation and usage of dumbwaiters varies widely according to country. After defecting from the Soviet underground in 1938, Whittaker Chambers gave a last stash of stolen documents to his nephew-in-law, Nathan Levine, who hid them in a dumbwaiter in his mother's house in Brooklyn. A decade later, Chambers asked his nephew to retrieve them (which Chambers referred to as his "life preserver"). Handwritten and typewritten papers therein came from Alger Hiss and Harry Dexter White (and became known as the "Baltimore Documents"). Microfilm contained therein was subpoenaed and sensationalized (misnamed the "Pumpkin Papers" in the press) by Richard M Nixon for HUAC. Harold Pinter wrote a play in 1960 called The Dumb Waiter, in which a dumbwaiter forms a key element. In the 2005 movie Zathura: A Space Adventure, Danny uses his home's dumbwaiter to hide from his brother, and later to move around the house without being seen by the Zorgons. In Littlest Pet Shop, Blythe uses a dumbwaiter to get to the Littlest Pet Shop building and back (sometimes, the pets also use the dumbwaiter). In the 2018 film Jurassic World: Fallen Kingdom, Maisie Lockwood uses her family mansion's dumbwaiter to hide from the antagonist Eli Mills and later the hybrid dinosaur the Indoraptor. She also uses it to travel to its subbasement laboratory, where she meets Owen Grady and Claire Dearing. In the 2004 episode “Dougie Houser” of The King of Queens Doug wanted to buy the house with a dumbwaiter. When they finally got it, used it and broke it they decided to move into the other house that they currently live in throughout the show. ^ a b George R. Strakosch (1998). The Vertical Transport Handbook. New York: John Wiley and Sons, 1998. ISBN 0-471-16291-4. ^ a b c Harry Robert Cullmer and Albert Bauer (1912). Elevator Shaft Construction. New York: W.T. Comstock Company, 1912. p. 30. Limited Preview, Google Books, accessed August 26, 2008. ^ Quinion, Michael. World Wide Words: "Lazy Susan". 24 Apr 2010. Accessed 11 Aug 2013. ^ United States. Patent Office (1883). American Architect and Architecture, Volume 13. Boston: J. R. Osgood & Company, 1883. p. 11. Limited Preview, Google Books, accessed October 30, 2012. ^ United States. Patent Office (1887). Official gazette of the United States Patent Office, Volume 39, Issues 1-4. Washington: Government Printing Office, 1887. p. 252. Limited Preview, Google Books, accessed October 30, 2012. ^ J.H. Beers & Co (1897). Commemorative biographical record of Dutchess County, New York. Chicago: J. H. Beers & Co., 1897. p. 258. , retrieved October 30, 2012. ^ Anthony Avillo (2002). Fireground Strategies. Tulsa: PennWell Books, 2002. ISBN 978-0-87814-840-0. ^ See "ASME Product Catalogue". ASME. Archived from the original on 2007-12-26. Retrieved 2008-08-26. ASME A17.1 covers safety for new elevators; A17.2, elevator inspection; A17.3, safety for existing elevators; and A17.4, emergency procedures, including those applying to modern dumbwaiters.